If you’ve decided that you would like to benefit from a solar PV installation and that you would like us to provide you with a quote, then here’s a quick summary of the installation process. To make your enquiry either call us on 01454 324807, send an email to contact@greenleafinnovations.co.uk or use our contact form. 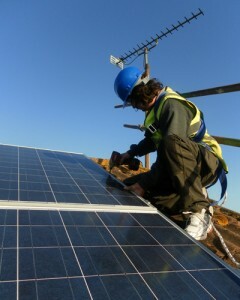 For a commercial solar enquiry ask for Chris – then he’ll arrange to discuss how best Greenleaf Innovations can help you. A desktop study will be conducted to provide you with an estimated system size, price and returns. We will usually maintain or sometimes even reduce the estimated price following the survey, though would ask that you realise that we will not be able to provide a comprehensive quotation without a site visit. It is best to organise an EPC as early as possible in order to determine if you will be able to achieve your desired payback period. The Feed in Tariffs are tiered based on the energy efficiency of the building. You’ll need a property in Band D or above to achieve the highest rate of generation tariff. You can either organise the EPC yourself or we can organise it on your behalf. I will visit you to check the dimensions of the available roof space, the condition of your roof structure, the condition of your electrical installation and to discuss the installation process with you. We will need to ensure that there is an appropriate space available for mounting the inverters. Following the survey I will be able to design and quote for a suitable solar panel installation for your property and your budget. In the majority of cases the actual installation of the panels and wiring takes one day, sometimes two, depending on the size of your system. Scaffolding will be erected the day before we start. The installation team will usually consist of a project manager, with two or more roofers and electricians. These will be certified under Competent Persons Schemes so there is no need for you to pay building control fees etc for the work. See the section Get Rewarded for further information. With your EPC and MCS certificate you will be able to apply for the tariffs. These are usually straightforward, but I’ll be happy to fill out the majority of the application with you whilst the installation takes place. If you’re looking to generate your own energy and think that solar power might be the answer then please contact us via the Contact Page, phone on 01454 324807 or email contact@greenleafinnovations.co.uk. We look forward to talking to you.